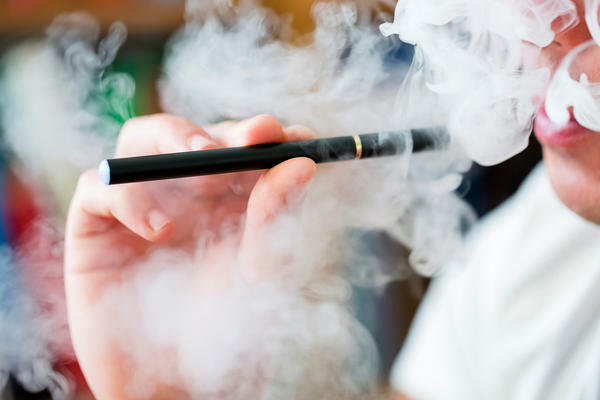 Vapor from e-cigarettes contains toxins, although fewer than conventional cigarettes. "In some circumstances, such as their use by nonsmoking adolescents and young adults, their adverse effects clearly warrant concern. In other cases, such as when adult smokers use them to quit smoking, they offer an opportunity to reduce smoking-related illness." In fact, 15 of the studies NAS reviewed found that when teens and young adults use e-cigarettes, they are more likely to try regular tobacco within a year. "We found that kids who tried e-cigarettes, hookah, or smokeless tobacco or cigars — any non-cigarette tobacco product — were all twice as likely to try cigarettes a year later, compared to kids who hadn't used any of those other tobacco products," says Shannon Lea Watkins, a public policy researcher at University of California, San Francisco. Watkins and her colleagues also found that the effects of using non-cigarette products compound: "Kids using two or more non-cigarette products were four times as likely to report using cigarettes a year later." However, it is not yet known how much tobacco they use on a regular basis and whether it became a habit. More long-term studies are needed. Eaton emphasized that there is insufficient evidence on whether e-cigarettes work as well as either no treatment or FDA-approved smoking-cessation treatments, such as nicotine patches or gum, to get smokers to quit. E-cigarettes are still fairly new and are largely unregulated. The were introduced only in 2003 as an alternative to tobacco-containing cigarettes, which is why the government requested that the analysis be conducted. The report found that most e-cigarettes contain nicotine, even if they are marketed as flavored like bubble gum and potpourri. The report also found that emissions from e-cigarettes do contain some harmful byproducts like metal, but far less than conventional cigarettes. "Conventional cigarettes burn, and in the process of burning tobacco, a large number of fairly toxic chemicals are generated in the tobacco smoke," Eaton says. So there are more adverse health effects related to these combustible products. However, a recent national survey suggests adults do not believe that e-cigarette vapor is toxic. Food and Drug Administration Commissioner Scott Gottlieb says the report "helps identify areas that need further study to better understand the net public health impact of e-cigarettes ... . We need to put novel products like e-cigarettes through an appropriate series of regulatory gates to fully evaluate their risks and maximize their potential benefits." FDA commissioned the report at the direction of Congress to evaluate evidence of health effects of e-cigarettes after it delayed proposed regulations last year. Matthew Myers, president of the Campaign for Tobacco-Free Kids, issued a statement expressing disappointment that the FDA has not acted quickly enough to regulate these products. "This report shows what happens when a new product is introduced without meaningful government oversight. It demonstrates why the FDA should fully and aggressively implement the overdue e-cigarette regulations that took effect in August 2016," it says. The national academies report calls for more studies. To another story now, conflicting news about e-cigarettes. A new report from an expert panel concludes that electronic cigarettes might help adult smokers quit. But the National Academies of Sciences panel finds that e-cigarettes might entice teenagers and young adults to experiment or even start smoking tobacco. NPR's Patti Neighmond reports. PATTI NEIGHMOND, BYLINE: Congress asked for this report to try to sort out what's known about the potential benefit and risk of e-cigarettes. Researchers examined more than 800 scientific studies. They found some promise e-cigs could be helpful to adult smokers. David Eaton of the University of Washington chaired the committee. DAVID EATON: There is some evidence that for people who are currently smokers of combustible tobacco products, cigarettes, that e-cigarettes can help people quit smoking. And that's the beneficial side of these things. NEIGHMOND: However, it's not known exactly how effective they are compared to other FDA-approved treatments to quit smoking like the nicotine patch or nicotine gum. And there's strong evidence, says Eaton, that e-cigs are helpful only when smokers switch completely from tobacco products to e-cigs. Eaton says the clear concern raised by this report is that when teens and young adults use the e-cigarettes they're more likely to try regular tobacco cigarettes. EATON: E-cigarettes are addictive. And there is evidence that they can lead to initiation of smoking. And those by themselves right there are reasons that youth should think twice about it. NEIGHMOND: Shannon Lea Watkins headed one of the 800 studies reviewed by the committee. She's a public policy researcher with the University of California, San Francisco. SHANNON LEA WATKINS: We found that kids who tried e-cigarettes or hookah or smokeless tobacco or cigars, any non-cigarette tobacco product, were all twice as likely to try cigarettes a year later compared to kids who hadn't used any of those other tobacco products. NEIGHMOND: And that temptation to try tobacco cigarettes, she says, was easily exacerbated. WATKINS: Kids who were using two or more non-cigarette products were four times as likely to report using cigarettes a year later. NEIGHMOND: Most e-cigs, despite their colorful packaging and creative flavors like gummy bear and cotton candy, do contain nicotine, which is known to increase heart rate and blood pressure and is highly addictive. In fact, Watkins says the amount of nicotine in e-cigs is typically comparable to the amount of nicotine found in conventional cigarettes. But Watkins says it's not just the addictive quality of nicotine. WATKINS: Using these products might change a kid's perception of the harm of cigarettes. And so they are perceived as less dangerous. And they get used to using tobacco. And so using conventional cigarettes is not so scary or, quote, unquote, "bad." NEIGHMOND: And using e-cigs might change the culture or social group young people are involved with. WATKINS: It will expose them to different kinds of kids, maybe kids that are already using conventional cigarettes. And then they might go on to try them. NEIGHMOND: E-cigarettes have been on the market for about a decade. They're largely unregulated, and it's not known exactly how much nicotine or other toxic chemicals are in them. Last year, the FDA established new rules to better oversee e-cigs, along with cigars and hookah tobacco, and banned the sale of any of them to anyone under age 18. Patti Neighmond, NPR News. (SOUNDBITE OF IV THE POLYMATH'S "SETBACKS") Transcript provided by NPR, Copyright NPR.